Just opened up the second Stawasz book and this pattern on page 59 jumped out at me and screamed TAT ME!!!!!! 7.5 hours.....2 full restarts from the second row and one whole third row cut off...LOTS of regret using Lizbeth 20 (feels like rope and has slubs all over the place)....sworn at and chucked in the bin. ( Gunna miss that fireplace!!) But it is done as far as it is going to get this week at least. Rows from here on hopefully won't be so cruel!....long chains - Always a challenge! I am SOOOO out of practice! What is a Liyarra you ask?? Well.. she is now a part-time totally addicted, obsessed tatter. Part-time because new "old" pursuits have popped up their heads and demanded my attention over the last 18 months or so ...INCLUDING...photography and flying!! Yep - my partner Ben is a photographer, news cameraman and an obsessed pilot so of course he needs a willing "soundie" and co-pilot!! Hmm....Gee wonder where he can find one of those???? He also actively encourages my return to tatting and that makes him perfect! 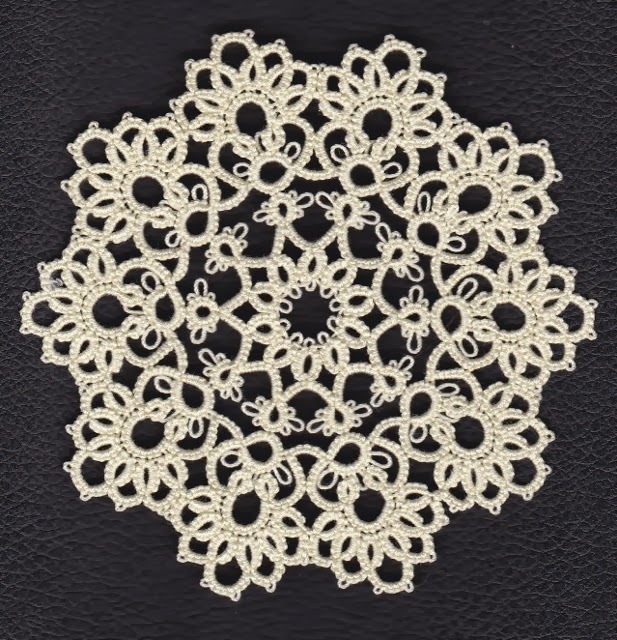 Tatting still holds a great place in my heart. I still believe you can never learn enough, read enough or tat enough in this lifetime.